My sister-in-law texted me last night a picture of the Dungeness Crab Sandwich at Beecher’s restaurant in Seattle. You know, the sandwich that I wanted most to try, of all foods in Seattle, and they. were. out. I laughed. Then I felt a little sad. I mean, our dinner was Papa Johns. Our table? A large Tupperware storage container. My chair? A beach chair that sits 4 inches off the ground. I texted back, “!!! Get it. Write an essay on its epic-ness. And I will try to be happy for you and live vicariously through you.” Crab, it gets me goin’. Kind of like American-Chinese. Chinese food in many US restaurants is a matter of choice. Do I choose this fried piece of meat slathered in this sauce…or this fried piece of meat in that sauce? Hmmm. Authentic or not, it’s delicious. Good for you? Not so much. But recipes like this can change that. Stir frying can be just as good, maybe even better. This recipe from Cooking Light had 5-star reviews. That’s generally a strong indication that dinner will be good, and approved by all. All being…Mr. Prevention. 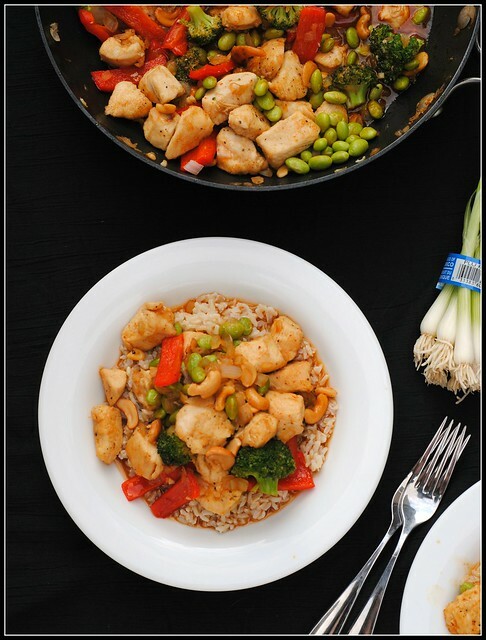 This recipe utilizes all the Asian flavors that work to create truly flavor-packed meals. Ingredients such as toasted sesame oil, Sriracha, rice vinegar, honey, and soy sauce should be staples in the kitchen of any home cook. 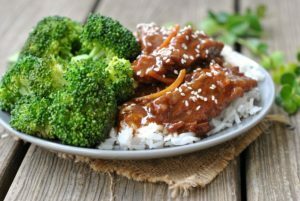 Unlike the Americanized Chinese we so commonly find available, this meal packs lots of color (vitamins, minerals, and antioxidants) and lean protein. I even managed to use up the last of my edamame reserves for this one! Feel free to get creative with the veggies — to bulk them up or change them up. Just don’t forget the cashews…you’ll love that crunch and nutty flavor. Combine chicken and next 3 ingredients in a bowl; toss to coat. Heat a large skillet over medium-high heat. Add sesame oil. Add chicken mixture, and sauté for 4 minutes or until lightly browned. 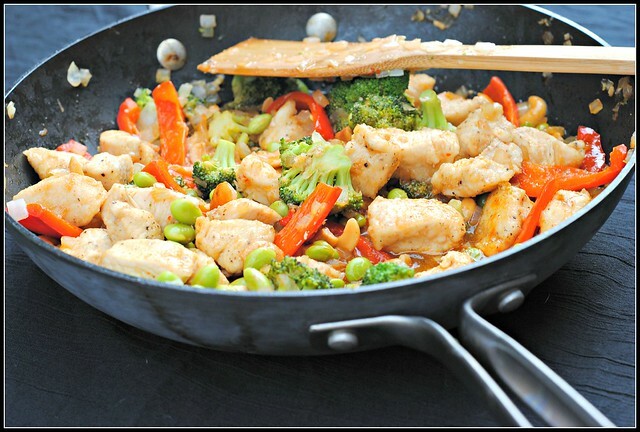 Increase heat to high, and add broccoli and the next 4 ingredients (through red bell pepper). 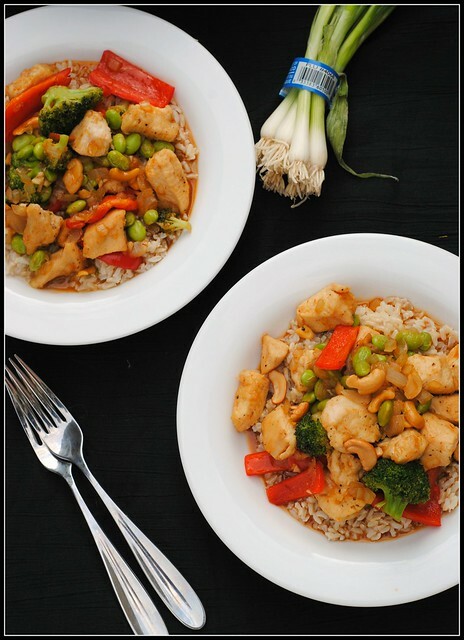 Cook 5 minutes or until vegetables are crisp-tender and chicken is done, stirring frequently. Stir in cashews. Combine vinegar and remaining ingredients in a small bowl; stir with a whisk. Add vinegar mixture to chicken mixture; toss to coat. Serve with rice. Result: A quick meal ready in about 30 minutes. The sauce had great flavor and just a touch of spice. The leftovers reheated great for lunches and this was definitely husband-approved. Enjoy! Today we get to reconnect with old friends from Mr. Prevention’s work. Some of them I haven’t seen since 2008! Time flies. Well if you couldn’t get the sandwich, at least you could eat it vicariously. I’m always intimidated by cooking Asian at home. But this looks really simple. Thanks for sharing! This recipe looks fabulous!! I love cooking Chinese food at home. So much healthier! I’ve been wanting to make this ever since I got the Cooking Light it was in!! Better do it now, it looks just like the cashew chicken from my favorite Thai restaurant. Mmm I shouldn’t read about food before 10 am..
Fabulous stir-fry! I think this recipe just nudged out my favorite. I love the technique of coating the chicken pcs in corn starch – it makes the chicken nice and crispy on the outside. I loved the veggie combination and the sauce is soooooooooooooooooooooo good! Love the spice! P.S. 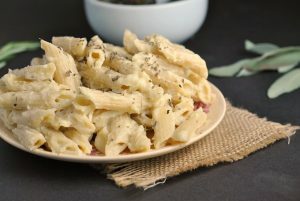 I know this recipe post is a year old, but I’ve been having fun looking through your posted recipes and finding some to try! Thanks for another great recipe! 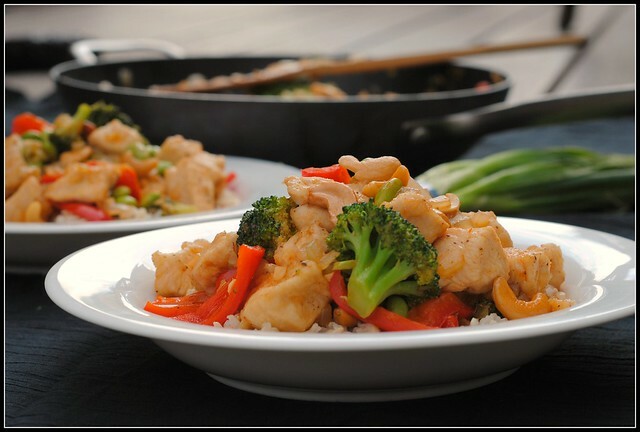 I have tried many recipes for cashew chicken and this one is the best by far. Most do not have enough spice and this one benefits from the sriracha. It also came together very quickly and was the perfect weeknight meal.